Jazz Guitarist? Want to feel more confident in your foundation and excited to improvise with your bandmates? So you want to know the right stuff, how to play the standards, and you want to be confident that you can USE all that stuff you've been working on when it matters. So here's where I can help you. I can show you the exact things to work on right now. We have a space here to work together, just you and me, on the things that matter to you. 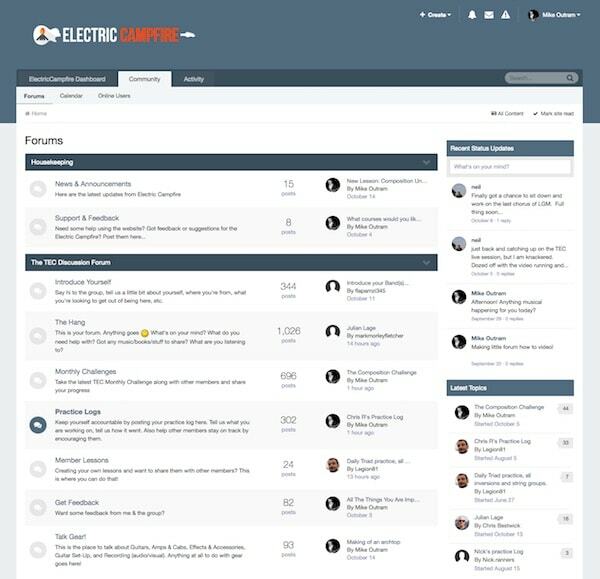 And, here at ElectricCampfire you'll find 600 other guitarists who are moving forward with their playing and sharing the journey to finding that spark of excitement in playing music. 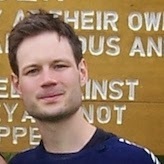 Check out Mike Outram's website ElectricCampfire.com. If you want to get some jazz lessons - this is the man. He's who I go to when I'm trying to get my jazz chops together! Our library of over 25 video lessons provides training and practical advice on all aspects of guitar playing, improvisation, practising, harmony and much, much more. Our guest expert workshops give you creative ideas & practice tips from some of the best guitar players and educators in the world. ​You'll get to share ideas, get feedback, and contribute to our amazing community of like minded guitar geeks from all over the globe. You get a private forum thread where you can get Mike's 1-2-1 guidance & feedback anytime you want! We regularly take on a new and varied creative challenge together. It's a powerful, fun way to learn alongside other people. The routine is designed to take you no longer than 30 minutes. It’s a series of short, highly condensed daily exercises. Some of them are simple; some are very challenging. I show you how to build each exercise so you can start using them today, and build up your control over the materials. You’ll improve your physical and mental dexterity with the fundamentals. My goal is for you to be FLUID with the fundamental material, so you can apply it however you want. This 8 part series will help you play solos that tell a story. It's about how to play IDEAS, how to DEVELOP your ideas, how to sound interesting, how to play a solo that sounds like a piece of music and not just a series of unconnected scales. It's all about being musical. In this course you’re going to build a rock-solid foundation for sight-reading on the guitar. Plus it’s just a great foundation for music in general. And from there you'll go through a step-by-step system that'll build your ability to sight read confidently in the first 7 major keys around the 5th fret area. In this series, I show you how to learn Wes Montgomery's tune 'Mi Cosa'. But it's also about how to learn tunes. You’ll learn how to 'see' the musical shape and form of a piece so that you can memorise it and produce a more musical performance. You can apply these ideas to learn any tune. It'll help you learn tunes quicker. And you'll learn tunes in much more depth. This series is an analysis of Emily's amazing solo from the album East to Wes. You'll learn how to play it, what she's doing, and how you can apply the ideas to your music. A series of exercises to increase your triad knowledge. Getting a strong command of triads will help you to play on chord changes without having to learn a million scales. These exercises are short challenges. As you go through this course, you’ll become more fluid with triads. Triads are maaaaaaaaasively useful, and you should totally know them. In this series, you'll learn how to get those rich open voicings you'll hear piano players using all the time. These voicings use 4ths and upper structures. You’ll learn from my comping examples. I’ll show you techniques and devices to add musical variety and interest to your comping. This course will give you phrasing that’s fluid - Really fluid. You'll make the guitar, and your technique work for you rather than against you. You’ll learn how to CONTROL the instrument and make your phrasing sound the way you want. In this is a series of short harmony lessons you'll learn one simple harmonic nugget. Each lesson is no longer than 5 minutes, and there’s ONE actionable thing to practise for each lesson. This is different to the other series where the lessons are super in-depth. This series covers 5 common voicing types and their inversions. 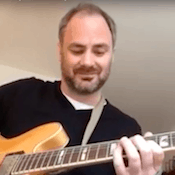 You'll learn how to play each voicing, how to play each set of inversions up and down the fretboard, how to smoothly connect [voice-lead] the chords, how to apply these voicings to tunes, and WHY you might choose particular voicings for particular musical settings. 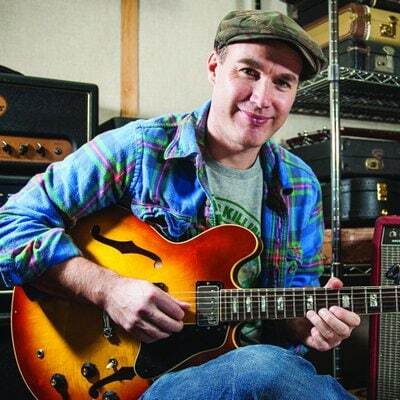 In this series, I walk you through some of the features of Kurt Rosenwinkel's playing. My introduction to one of the modern masters of the guitar. You'll learn all the Melodic Minor Modes - How to use them. Where to use them. When to use them. I'll show you how to get these sounds into your playing. You've heard Robben Ford use the altered on 'Help the Poor'? Well, there are six other modes you can use too. In this series, I walk you through how to play Ted Greene's beautiful arrangement of 'Hark! The Herald Angels Sing'. We discuss how to perform a solo piece. How to bring out the sound of inner voices. How to 'shape' a performance. You'll learn how to nail the changes to a blues using chord tones. That's the surface-level thing, but we go much deeper - this course is all about connecting with your bandmates. How to get inside their heads, how to dictate the action, how to react, how to think on your feet, how to have fun in those moments of magic! Wouldn't it be nice if there was a place where other guitar nerds, just like you! could go to chat about, say, John Scofield's voicings, or Larry Carlton's phrasing? Well, Holy Coincidence! Did the planets just, like, re-align themselves right now? Because, this, my six-stringed brethren & sistren, is EXACTLY what our Forum is all about. Get Instant Access to Electric Campfire! 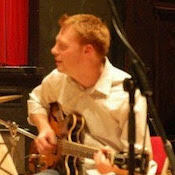 Hi, I'm Mike Outram - guitarist, improviser, composer, teacher, and the founder of Electric Campfire. I've been a professional musician for around 25 years and have had the privilege to take part in international tours, sessions, & recordings with Steven Wilson, Carleen Anderson, Herbie Mann, Tim Garland, Theo Travis, Nikki Iles, Steve Lawson, and Laura Rossi. I love being part of a group and taking on different musical challenges. Also, I'm Guitar Professor at The Royal Academy of Music, Trinity Laban & The Guildhall School of Music, London where (for almost 20 yrs) I've worked with the next generation of incredible young musicians. 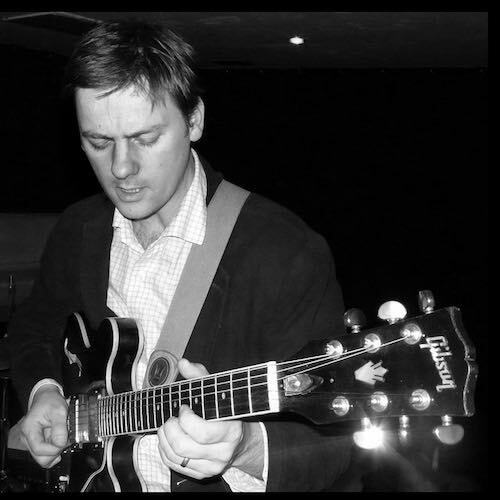 A couple of years ago I started writing about improvisation, guitar playing & creativity on my blog and kept getting asked for more in-depth material. Hence this site was born and here we are! The vibe here is about being more creative with your music & guitar playing, nailing the foundations, and making it happen on the bandstand. Yes, you'll naturally find a lot of material about jazz and improvisation here, but we're all huge fans of all things guitar and especially playing and players who use the instrument creatively. We love Derek Trucks, Muriel Anderson, John Renbourne, Guthrie Govan & Jerry Donahue just as much as Wes Montgomery, Emily Remler, Kurt Rosenwinkel, Jim Hall & Pat Metheny. Electric Campfire is a place where all that good stuff is celebrated and we aim to share these creative sparks to inspire you. Bottom line is that I think my playing has improved more in the last year than in any other year I can remember since I'd learnt the basics and Electric Campfire has been possibly the most important thing driving and enabling that progress." "My playing has undoubtedly improved by virtue of the fact TEC has got me out of that vicious cycle of just noodling with absolutely no direction. There's always a lesson or a challenge to take up. I really like the mix of exercises (like the triad quest, practice routine), pieces (Zhivago, Mi Cosa, Softly) and philosophy (Play Better Solos). I feel like I am moving forward again, even if it's slowly. "It's great to have such a positive community feel on this site. I am loving the material as well as the feedback :-)"
"TEC has turned my relationship with the guitar around completely. I guess I did effectively give up too, although I hadn't thought of it like that. Wasn't playing music, and just picked up the guitar at random times to play whatever was in my head/fingers or to read a bit of music, but totally sporadically and with no goals in mind and no purpose. It had been like that for years I guess…. "Overall what's worked for me - in the sense of seeing some progress - has been having limited goals, and within them, focussing systematically and consistently on particular aspects of theory and technique. You've done this for me by constructing the practice routine! The videos *work" too, they're a big help to make sure I've understood an exercise/lesson." "The result was much better than I expected and I really feel that this is the result of working so much on my ear as I have since the Chet Baker challenge in September. It has really changed the way I listen, and the clarity of the music in my head is much more precise." "I feel I have learnt much more than in any other musical activity, Mike is really a unique teacher and I am happy to be part of this site with all of you." So that's how this site and the community is making a difference to people just like you. Now it's up to you. Do you want to play better, enjoy your learning & surprise yourself? Ask yourself, what would happen to your playing if you had expert tuition & guidance plus an amazing community available to help you whenever you want? ​ ​​​Get Instant Access to Electric Campfire! PS: The 14 day trial is completely free, no hidden costs or anything. If you want to stick around, Electric Campfire will cost you just $35/month, or $240/year and you can cancel ANYTIME with just two clicks, no hassle, no questions asked.